I remember looking forward to each new publication from Gourmet magazine. The pictures of scones heavily laden with jam, cookies striped to perfection, landscapes I could jump into… I would clip these and post them above my office desk for culinary inspiration. And the stories! If Brancusi had you over for the night, you were sure to have steak. And cooked to his liking. 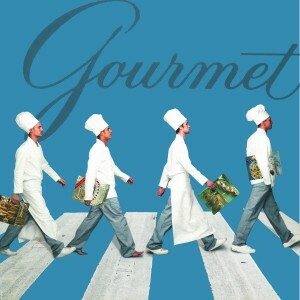 I remember the day I found out Gourmet magazine was going to stop their printed publication. Those last few magazines that arrived in the mail were met with mixed feelings of happiness and loss. A few months back, Ari told me that he was giving a talk on Olive Oil in America. He said he was looking for old advertisements, and if I had time, it’d be great if I could take a peek at a private collection in town of Gourmet magazines going back to the ’40s. If I had time? I made sure I did! I could have gotten happily lost in those stacks for days, so I gave myself one morning to travel though years and years of the Gourmet food world. Sound fun? Now you too can take a look at some of that collection–handpicked from U-M Library’s Janice Bluestein Longone Culinary Archive. One issue from each of Gourmet’s 69 years of publication (1941-2009) is on display as well as books published by Gourmet and books published over the years by leading contributors to Gourmet. Jan Longone, adjunct curator of culinary history at U-M Library, talks about the exhibit on November 18 at 4 p.m. in the Hatcher Library Gallery.